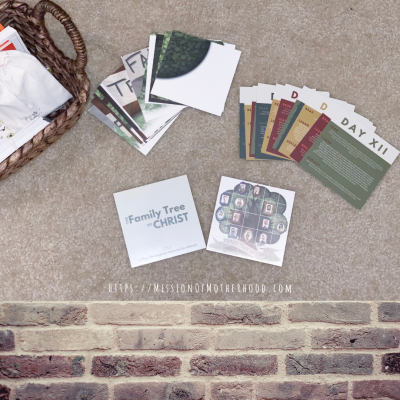 I mentioned some of these resources over on the mothers ministry resource page I recently created, but I want to specifically talk Advent in this post. I’ve linked directly to them for your convenience. There are no affiliate links from me in this post, but you can read more about my disclosures policy here. Remember that most of these are small business owners who do a little happy dance this time of year, so whenever possible: shop small and help a small business owner or blogger out! 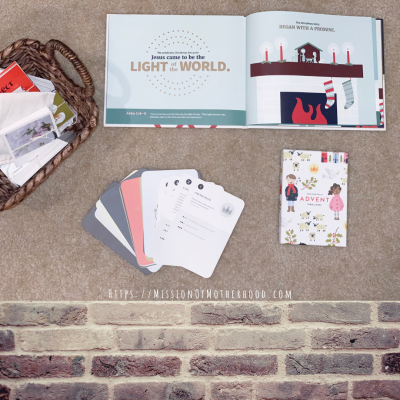 I’m loving the “This is the Christmas Story” book and cards for kids by She Reads Truth. The hardcover book is perfect for kids who enjoy reading, but since mine are 3 1/2 and 17 mos, it’s the perfect length for me to read to them. Claire can point out letters she knows and fill in parts of the story she knows, and she can memorize the verses with me. Each page contains Bible verses along the bottom. 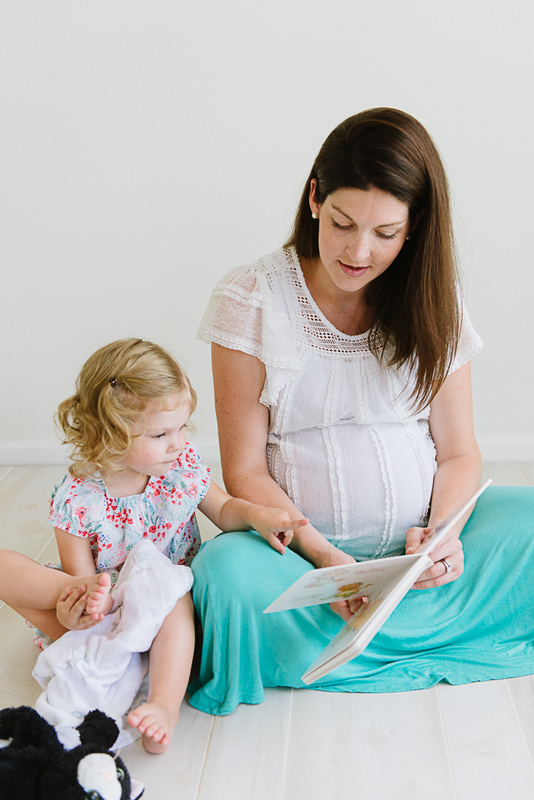 Nora can point out animals and babies and say their sounds, and that’s awesome because it means she’s engaging with the story, too! There’s discussion questions in the back, and the book is undated so it’ll work for years to come. I especially love the different colors in the book. I get so bothered by a lot of Christmas scenes that have a smiling blue-eyed, blond-haired baby Jesus. Sorry folks, that’s just not realistic. God created us all in His image, so I believe diversity is extremely important and valuable in the kingdom of God. The cards are a wonderful asset to the book study. 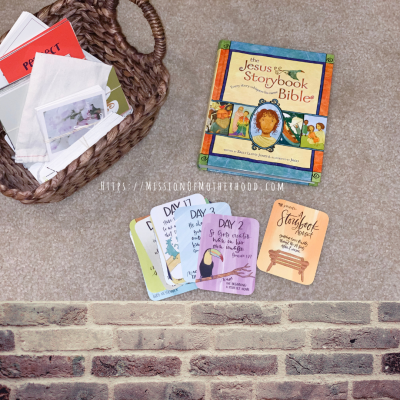 They’re a great tool for both my kids: I love the pictures on the front, I love the Bible references on the back, and I love the study questions, making it easier to dive deeper into the story with older or more advanced kids. One of my favorite resources for discipling tiny future believers is Crew and Company. If you follow me on Instagram, you may have seen me rave about this company in my stories. I am a sucker for bright cards with hand-lettered Bible verses on them, what can I say?! 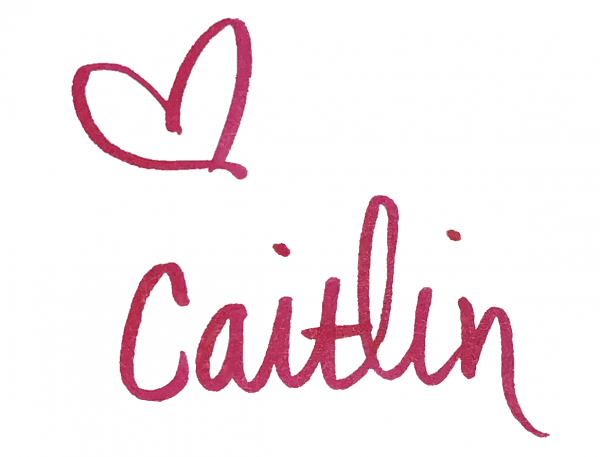 I’m not a brand rep or an affiliate, I’m just a really satisfied customer! Her Advent cards are no different: 25 cards, corresponding to 25 stories in the Jesus Storybook Bible. The great part about buying this bundle is that it’s a great gift set for a friend or family member, and it comes with little tiny clothes pins and a twine for hanging the card. TRY TO TELL ME THAT DOESN’T MAKE YOU WANT TO GO OUT AND BUY IT RIGHT NOW. I love that each card has a short verse on it, and I love that it’s just one more purposeful way of seeking out God’s word. The Tiny Theologians Family Tree of Christ Advent Cards are my newest addition to the bunch. I like them because I think in this case, they’re more for me. It’s good solid genealogy of Jesus in a 25-day puzzle. The great thing for kids is that they can participate in the puzzle and learning the names, etc. I think this is going to be such a great resource for us as a family as our kids get older, too. There’s an answer key and each card has a day and verse/fact on the back. You don’t have to have a ton of prior knowledge to be able to enjoy these cards! The Truth in the Tinsel is another great family Advent resource. It’s a $10 eBook which I hadn’t heard of before, until I got invited to do a craft swap with a few other moms. We signed up for 1 craft for each kid, prepped the craft, and then exchanged them at a meet and greet with refreshments while the kids played. It was a great way to get to know new people, see how other people interpret craft ideas, and share a little bit about ourselves. This would have been a GREAT idea for the Mothers Ministry the Friday before Thanksgiving, and I’m wishing I’d have known sooner. I might plan to do this next year, or else try to figure out some kind of low-cost, low-stress exchange for this year when we meet in mid-December. The best part about most of the crafts is that I already had most of the stuff on hand at my house. Anything I needed I found at the Dollar Tree. It’s so fun to get creative, though, and your kids don’t need a lot! The best, very best, part about this book and it’s activities is just pointing kids back to Jesus. He’s the whole reason for this season. There are a TON of Truth in the Tinsel add-on activities, such as this one which gets kids up and active each day, and others that you can read more about here on Amanda’s blog. 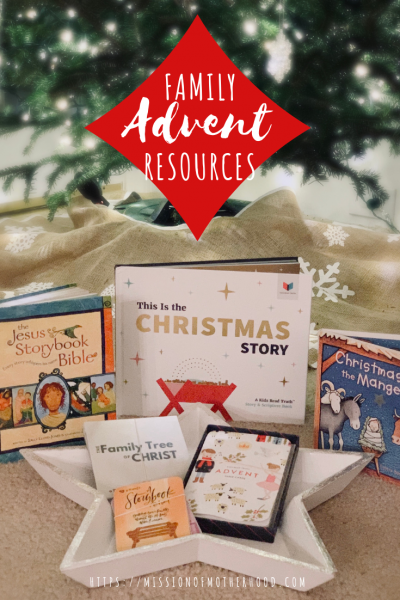 What are some other Advent resources? What are you using? What are, or have been, your favorites? What did I miss? Have you used any of the above? Tell me everything! Leave a comment here or on Instagram, or send me an email — I wanna know!